If you are used to windows then most of you already know about this command CHKDSK and what it does. And if you don't know about it, then you should know this because this will help you a lot. Read more and find out about this helpful command. 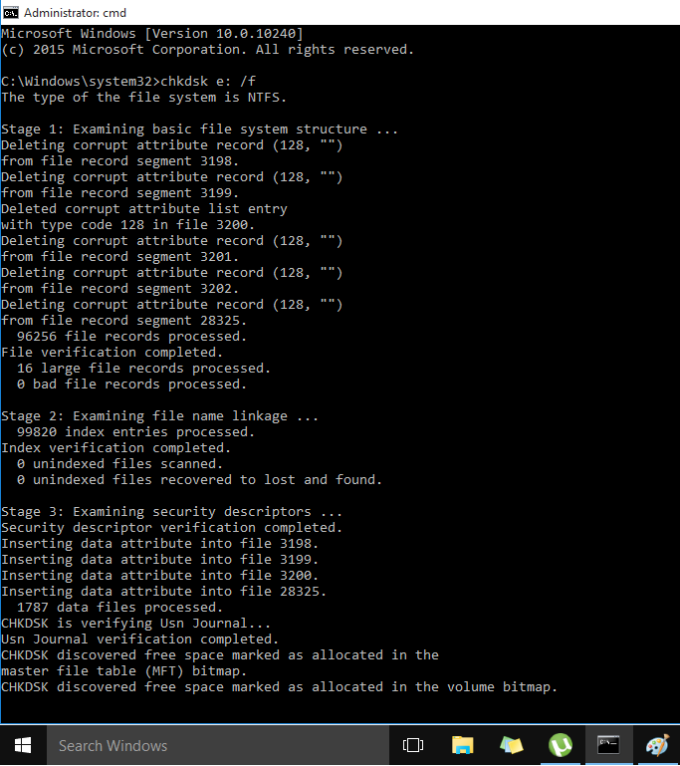 CHKDSK (full form is "Check Disk") is a Hard Disk scanning and repairing command system utility tool which was introduced some what like three decades ago. Yeah you heard it correct. It was introduced that time ago but still it is being used in our latest Microsoft Operating Systems and yeah even in Windows 10. First make sure the drive which you are trying to scan and fix is not being used or accessed. 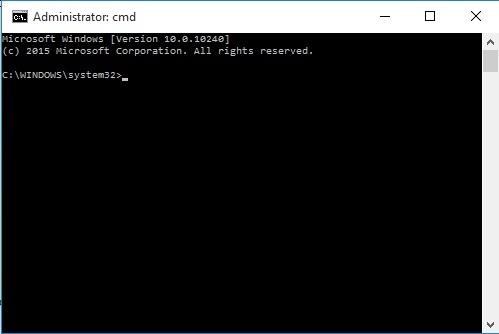 Open your command prompt (or cmd) on administrator mode. On your command prompt things should look like this in administrator mode. Note the part in the red. If it is as it is then you are accessing the command prompt in administrator mode. If not then you are not in administrator mode. What if you don't know how to open command prompt in administrator mode? A window will appear which may say like "Do you want to allow this app to make changes to your PC" or something like that. Click on Yes. Now that you are in command prompt with administrative priviledge. Lets just say you want to check the drive e: of your computer. For example, here we want to check and fix the drive e: so you need to type chkdsk e: /f and press enter. If you type /f only then it will only scan and fix the file system structure, file name linkage and security descriptors of your drive. This step will complete in 3 stages and takes only little bit of time. Generally typing /f will fix most of the errors of your drive, but if you are sure that your drive have errors then you can run the through and detail analysis of your drive by typing chkdsk /f /r /x. But remember this will take lot of time to complete. The “/f” parameter orders CHKDSK to fix any errors it finds; “/r” orders it to locate the bad sectors on the drive and recover readable information; “/x” forces the drive to dismount before the process starts (forces the drive to dismount means that drive will be temporarily unavailable until the scan is finished). If you type /f /r /x all at the same time after CHKDSK then it will scan file system structure, file name linkage, security descriptors, look for bad clusters and verify file data and free space. This whole scanning and fixing process completes in 5 stages and takes load of time to finish. As I have already mentioned that First make sure the drive which you are trying to scan and fix is not being used or accessed. We wont be able to check the system boot drive or the drive on which your windows or operating system runs (drive c: by default) because it is being used to run the operating system. But it can be scanned on the next restart or startup of your computer. 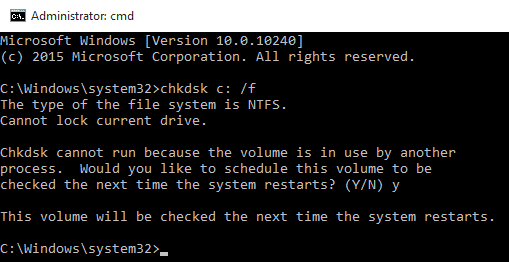 Typing chkdsk c: /f on command prompt will ask you if you’d like to run the command before the next boot. Type y for “yes,” restart the computer, and the command will run before the operating system loads, allowing it to gain full access to the disk. You can use chkdsk command on all version of Windows, XP, 7, 8, 10 and possibly in the future too.